This article is about the volcano. For other uses, see Mount Rainier (disambiguation) and Rainier (disambiguation). Mount Rainier with Tacoma, Washington in front. Lua error in Module:Location_map at line 488: Unable to find the specified location map definition: "Module:Location map/data/Washington" does not exist. Mount Rainier is a mountain 54 miles (87 kilometres) southeast of Seattle, Washington, in the United States. The volcano is the highest mountain in the Cascade Range, at 14,410 feet (4,392 metres). The top of the mountain is mostly covered by snow and glaciers. 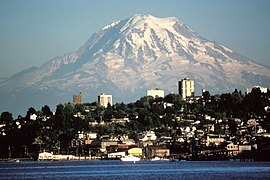 Rainier is an active volcano, but has not had an eruption for more than 100 years. Some describe Rainier as dormant or inactive. On March 2, 1899, U.S. President William McKinley made the mountain and area around it Mount Rainier National Park. It was the country's fifth national park. ↑ "Rainier". Global Volcanism Program, Smithsonian Institution. http://www.volcano.si.edu/world/volcano.cfm?vnum=1201-03-. Retrieved 2008-08-27. ↑ "Mount Rainier". Geographic Names Information System. United States Geological Survey. Retrieved 2008-10-15. ↑ Ball, Jessica. "Voices: Dead or alive ... or neither? Why a dormant volcano is not a dead one," Earth Magazine (American Geosciences Institute). September 8, 2010; retrieved 2012-6-14. Wikimedia Commons has media related to Mount Rainier. This page was last changed on 26 May 2015, at 03:36.